The ingredients and method used in putting this creation together looked really interesting to me, especially the crumble topping. I could already visualize the crumble being similar to the topping of an apple crumble pie fresh from the oven. Yummy! As I didn't have any buttermilk in the fridge, I wondered if I should drop by the supermarket on my way home to get a pack. I decided against it as I would then have a half pack left over and would have to source for another recipe so as not to waste the remaining buttermilk. Instead I substituted the buttermilk with milk instead, not the low fat kind. It took me a bit more time (compared with just a normal choc chip cake) to work through the various stages of putting the batter and topping together. Once everything was done, I popped the filled cake pan into the oven, set the timer for an hour and went about doing other chores. I occassionally popped back into the kitchen to take a peek. As the crumble topping melted in the oven, I noticed that it reached to the top of the cake pan - I was a bit concerned at this stage - what if it started to spill over ... oh dear, it'll make a mess in my oven for sure! Luckily it didn't rise any further (insert sound effects of a "sigh of relief")! After about a hour I inserted a tester into the middle of the cake - guess it needed another 5 minutes more in the oven. Once done I took it out of the oven and sprinkled the top with choc chips ... the bottom of the chocolate chips melted and glued onto the crumble. I really couldn't wait for it to cool and immediately cut a small slice to sample. DE...LICIOUS! 1) Preheat oven to 175 deg C.
2) Lightly grease a 9X4 inch baking pan, then line baking sheet around the interior of pan. Thoroughly mix the flour and sugar in a large bowl. Drop in chunks of butter, using a table knife, cut the butter into the flour until it reduces to the size of large pearls. Sprinkle vanilla essence over, working with fingertips, knead the mixture together until moist, clumpy lumps are formed. DO NOT overmix. 1) Sift the plain flour, cake flour, baking powder and baking soda. 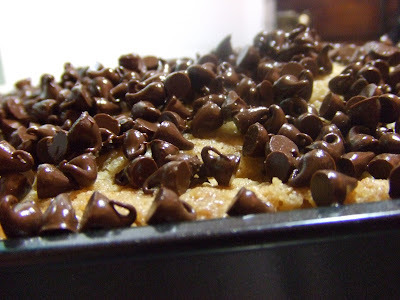 Then toss the chocolate chips with 1 tablespoon of the sifted mixture in a small bowl. 2) Cream the butter in the bowl of a stand mixer for about 3 minutes. 4) Add in egg and beat for 45 seconds. 5) Mix in the vanilla essence. 6) Alternately add in the sifted mixture in 3 additions with the buttermilk in 2 additions, beginning and ending with the sifted mixture. Scrape down the sides of the mixing bowl to ensure even mixing. 7) Stir in chocolate chips. 8) Spoon the batter into the baking pan, and spread evenly, smooth the top with rubber spatula. 9) Sprinkle the streusel topping evenly on the cake batter, make sure that the whole surface is covered. 10) Bake the cake for 1 hour or until a toothpick inserted in the center of the cake turns out clean. The baked cake should pull away slightly from the sides of the pan. 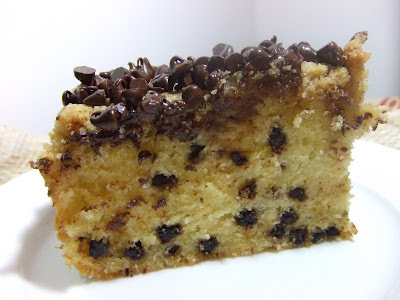 11) Remove the pan from the oven and sprinkle the chocolate chips evenly on top of the baked cake immediately. 12) Let the cake cool completely. Peel off the baking sheet from the cake, then sift some icing sugar on top of the cake. The dough looks so soft and yummy! Luv the recipe! The method usead to prepare this recipe is very complicated, i think that must have different methods.